It was a Saturday that we were going over to the Sapps house for our Winers get together. A few weeks back I mentioned to the group I planned on bringing a Texas Wine to share and hoped for feedback. We arrived a little early as I wanted to share the Cornelius first. I pulled the cork and poured eight glasses so the Tempranillo could breath. However, once the glasses were poured the girls were ready so I handed out the glasses and everyone tried their first sip. I think to everyone’s surprise, it was very good! 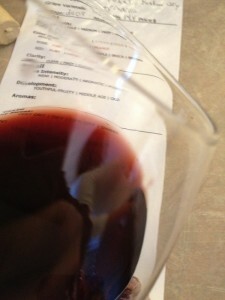 Before I joined the social I grabbed my tasting sheet and reviewed the 2009 Cornelius Tempranillo. Deep color depth and a dark purple to a “bricky” hue. There was a small amount of sediment in my glass and reading the label, I learned it was unfiltered. The aroma was moderate but smelled young. We noted jam, ripe red fruit, and oak. Slightly dry and medium bodied and my initial tastes were slightly tart. The tannins were medium but soft while the acidity was balanced. The Tempranillo was very flavorful with a nice ending finish. The wine was surprisingly complex with flavors of ripe fruit. I rated the 2009 Inwood Estates Cornelius Tempranillo three glasses as it was a very good! The “Winers” group was pleasantly surprised with the Cornelius. It held its own against a few Cabernet Sauvignon and Meritage from California. I have other wines from Inwood Estates and look forward to sharing them with the “Winers” group in the future. I plan on blogging the other bottles in the future. The next time I am in Austin we will make time and stop by Inwood Estates.